Often the quickest and most convenient way to safely store guns is by buying a gun safe. However, there are many clever gun owners that have come up with surprising ways to conceal their firearms while safely storing them out of the reach of children and thieves. We’ve got five ways listed below that can get your creative juices flowing too. While they many not be feasible for everyone, seeing examples of thinking outside the box (in this case, thinking outside of the safe!) can help you come up with your own custom hidden gun safes. It can also help limit cost – some of these solutions provide extra protection (like building a safe into a closet wall). Others are more expensive than a standard gun safe (like the shipping container idea!). Any way you decide to move forward, make sure that the guns are unable to be accidentally discharged by storing them without ammunition and storing ammo away from the guns. Also, if there are kids around or if you have a lot of visitors or parties, your storage solution absolutely must be able to be secured by a high quality lock. Finally, remember that your overall goal is the art of deception. What thieves can’t find, they can’t steal. First up is this amazing soda machine converted to a gun safe submitted on reddit by user Hartf1jm, pictured below. Where’s the gun safe, you ask? Exactly my point – you could never tell that there are guns stashed inside – check out all the images and explanation at this page. People buy soda machines all the time for nostalgic reasons, and to store their soda of course, so it’s not unusual that a person would have one in their home. Overall building a safe like this means that you are completely relying on deception to prevent theft of your guns, which is a huge upside, because most people would probably ignore the machine and look for valuables elsewhere. It is also an extremely frugal option – machines like these go on Craigslist for $50 to $100. The major downside is that there aren’t any features such as a UL listed lock or thick steel walls that would prevent a thief from breaking in if he knew that there were valuable items inside. It definitely wouldn’t pass the basic Residential Security Container test, and person with a crowbar could be inside the machine in just a minute. Our advice if you do decide to go with something like this is to never tell anyone that you don’t trust completely about it. Say you’re having a get together, and you want to show off your latest project on your workbench to some folks you met recently, and one of them looks across the basement and sees your soda machine, and asks if it actually works – just tell them it doesn’t, and don’t let on that it’s a safe. Many burglaries happen because the wrong person got just a bit of inside knowledge and took advantage. Another option for someone looking for a cheap way to deceptively hide guns in plain sight is a classic – the old hollowed out book. While you may have disregarded it because it seems like something that only exists in cartoons, it actually is a legitimate option for storing a handgun. EHow.com has a great detailed tutorial on how to make your own version of this “gun safe” here. Now “gun safe” is in parenthesis for a reason – because it’s not a gun safe at all! There are multiple major disadvantages to this approach to firearm storage. First, if you live in California, it doesn’t meet the basic requirements of the Firearm Safe and Responsible Responsible Access Act, which requires that guns be stored in such a way that children could not have access to them. I’m not a lawyer, so don’t take my opinion as the truth on the matter, but it sure seems to me that a book on a shelf does not meet the requirements of the law. Second, an experienced thief might know to look for this sort of thing, and it would be a simple and quick thing to quickly knock all your books on the ground to see what might fall out. Third, it would be easy to accidentally knock your gun to the ground while trying to get a book off the shelf. This could lead to unintended discharge and injury, not to mention property damage. Using hollowed out books seems feasible only if you own a small handful handguns at most and if you live alone with no visitors – but this is the bad option referred to in the title of this page! This is not only an attractive way to install a gun safe in your house, it actually increases security. Because this safe is stored in a tight place in a closet, a would-be thief is more limited in his options for getting into it. It’s much harder, if not impossible, to swing an axe properly in the tight quarters of a small closet. So, simple blunt force tools will not be as effective as they would be if the safe were out in the open in your basement. A thief with power tools still wouldn’t have too much of a problem sawing through the safe door, so if you decide to go this route, consider how you can better hide away any Sawzalls, circular saws, chainsaws, acetylene torches, or anything else that could be used to cut through metal. This method is also deceptive as the safe door can be hidden behind stacked boxes and hanging clothing. It also allows you to create a solid wooden frame around the safe that you can bolt the safe to multiple times in multiple directions. Bolting the safe down from the inside is one of the most important things you can do for the security of your safe, so the more bolts the better. Overall this option is more complicated and expensive than simply buying a gun safe, as you will have to either take the time to do it yourself or hire the job out. We’d recommend taking this on yourself for obvious reasons – the fewer people who know about your gun stash the better! Another drawback is that not everyone has closet space to sacrifice to a gun safe. If you do choose to do something like this, the Snap Safe Super Titan is a great option because it has thick 8 gauge steel walls and because it’s modular. Because you can carry it up stairs in pieces and put it together wherever you want it, it’s more convenient than lugging a 500 to 1,000 pound safe up a flight of stairs! 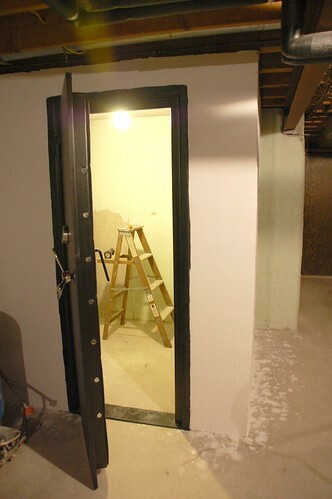 The folks over at 3 acres and 3 thousand sq ft describe how they used some space in their basement to construct a gun vault from cinder block walls. The vault door was bought from a company that sells safe doors, although these can be found on eBay and occasionally Craigslist if you’re lucky! The major advantages to something like this is obvious – it’s very secure and it’s huge! You’ll never run out of space to store guns and other valuables for sure! If you choose to build something like this, though, be sure to consult a professional, even if you decide to build it yourself. Last, but not least, is the most impressive hidden gun safe and unusual option – buying a shipping container and burying it in your backyard! If you’ve never heard of this before, it’s actually more common than you might think. A container like this can cost between $1,000 and $3,000, which may surprise you because that’s the same price range as a quality gun safe! However, the cost goes up as this is a major construction project. First, you have to pay to have it shipped to your property. Then, you’ll have to dig a hole big enough for it and prepare a foundation. Then, you’ll need to create gabion baskets to surround the container to provide structural support so the walls don’t cave in and to provide drainage. Then, you’ll need to create a quality, locking, hidden access door. Then, you’ll need to find a way to dehumidify such a large space so your guns don’t rust. Is that enough steps to convince you that this is the most expensive option in this article? There are some cool advantages to doing this, though. First, you have a nice storm shelter if you live in a part of the country prone to tornadoes. Second, you’ll have more than enough space for your guns – and probably more than enough space for a cool man cave. Third, if your access door to the container is well hidden, no thief would be thinking to look for underground gun storage. Hopefully this helped get your creative juices flowing – there’s always more than one way to get things done, and this is never more true than with gun storage. Just be sure to use your head, stay safe, and keep your guns locked up and out of the hands of kids, and you should be good to go!